"Beth Chaf," 139" x 102.5"
"Para IV," 101" x 137"
"Saf Gimel," 100" x 138"
The following excerpts are from an entry in the Larousse Dictionary of Painters (Mallard Press, 1976). 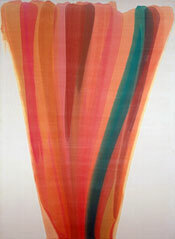 "Alpha Epsilon," 106" x 232"
Louis [b. Morris Louis Bernstein in 1912 in Baltimore] attained fame and became influential only at the moment of his untimely death [from lung cancer] in 1962. He trained as an artist at the Maryland Institute between 1929 and 1933, and spent most of his life far from New York, the centre of artistic activity. Although his home was in Washington, D.C., he took part peripherally in the Abstract Expressionist movement, following the painting of Jackson Pollock with keen interest. . . .
Louis had already adapted the large-scale format of Abstract Expressionism, but his paintings around 1954 were made by staining the canvas with colour, so that hues overlapped in veils of lyrical beauty. He sought effects so strong, and an emotional intensity so unequivocal, that even the largest available scale was insufficient. He was thus led to create an image with no beginning or ending, an image that theoretically transcended physical size. It was a brilliant spectrum of pure colour that appeared to have its origin beyond the edges of the canvas, and either swept through it or came to a sudden stop within the confines of the canvas. These vertical and diagonal "stripe" paintings of his last years were seen as a genuine departure from the two dominant wings of Abstract Expressionist painting in the 1950s, "gesture" and "field" painting. 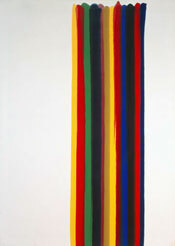 "Number 1-81," 82.5" x 58"
Together with these intense works Louis also executed numerous lyrical paintings where bands of colour, more hesitant, swept diagonally across the canvas from both upper corners, rolling off the edge at the bottom centre. These are known as the "unfurled" paintings.